We all have used, known and seen umbrella in our life. It is used to protect us from rain and sun. It is usually a dome shaped piece with a long stick in the center which is called a handle. The dome part of umbrella can be of cloth, plastic paper and even skin. 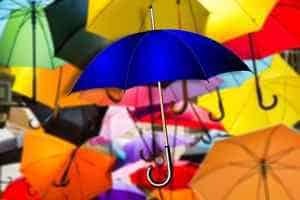 If somehow I get an opportunity to become an umbrella, I would love to be a multicolored one. I will choose multicolored umbrella because it depicts my colorful personality. Multicolored will be my facial look and my identification too. I will look charming in this facade as my new look compliments me fully. I got tired from my previously black face. The multicolored puts smiles on their faces which boosts my feelings too. After a long time, I have come into fashion again. Now I taste different material, shapes and sizes too. Young smart girls carry me. Remember the umbrella in the `zoobie-doobie` song of 3 Idiots. Yeah, she is my best friend and she looks beautiful. I watched her getting ready for hours before the shoot. Remember the legendary umbrella song ` pyar hua iqrar hua hai pyar se phir kyou darta hai dil` of Raj Kapoor and Nargis. That was my grandmother. I belong to a very rich legacy. It is totally a new world I am exploring. Thanks to the humans who have kept my existence alive from ages. In today`s world when everything is digitalise and modernized people are still looking for me when they step out of the houses. Cars are my biggest enemy on roads. If it was not for cars, I would have seen all my friends in other people`s hand. In convenience and shelter that a car provides them stops them from using me. I feel disheartened and ditched. But yeah, what about narrow lanes and streets. I am the queen there. My reign of simplicity and joy spreads wide and far in all the narrow lanes and streets where cars are not feasible to use. I am favourite of all because of my unique quality to provide protection from rain, snow and sunlight. I keep most of most away from you during rainy days. I am necessary for them who spend their time outside the home. I regulate body temperature by providing shade. I am cheaper as compared to cars and everyone can afford me. The qualities of umbrella signify my strength and inner qualities also. I try to shelter my loved ones from all pains and agony that might even try to lay a finger on them. I make sure that I protect my family and friends, the way my umbrella protects me. Umbrellas are strong and sturdy just like how I went to be. When need be, umbrellas can be compressed into smaller sizes if they are two or three fold. That way, they are very versatile and accommodating. Even I am striving for those qualities which make an umbrella stand apart from others. Greeks and Egyptians introduced the concept of umbrella to the world. They used it to protect themselves from the scorching heat of Sun. In some countries like India, China, Vietnam etc. they used it as a sign of respect for the kings. Even today Malaysians use it as a sign of royalty. In the 17th and 18th century ordinary people started using umbrellas. It is used by children, young and old alike. Umbrella comes in all shapes and sizes too. They are small, cheap and can be easily carried anywhere. The plastic umbrellas are very cheap and delicate. It is called parasol and it is used to get shade from sunlight. These types of big umbrellas are used at sea-side and beaches. Japanese people are very fond of umbrellas and it is called Kasa there. We have seen canopies in monuments of Mughal era. We noticed that in parks also these canopies usually called Gazebos are umbrella shaped. These are popularly known as `chatris` which in English means `umbrella`. It is basically the fabric which decided the type of umbrella. If it is made of cement and mortar in building it is known as canopy and when it is made up of plastic and used at sea side, it is called parasol. Some parasols are not water resistant because their basic motive is to provide shade. The word umbrella comes from the Latin word Umbra which means shade. Umbrellas are manually-handled portable devices for personal use. But large umbrellas are also used in golf courses by the players for protecting themselves and their carts from rain and sunlight. Umbrellas are of three types basically one fold, two fold and three folds. In one fold umbrella the canopy collapse but the pole remains taut. It is generally large in size but durable. In two fold or three fold umbrellas the pole and the canopy both retract and fold the umbrella into a miniature model which can be easily carried in a bag or handbag. It is very popular among the people because of the convenience it provides. Now-a-days, it not only protects against sun and rain but snow also. There are several references where the usage of umbrella is depicted in ancient art and culture also. Several modals use umbrellas as accessories along with their dresses on the ramp during fashion shows. Girls carry them in glamorous style with their dresses to show modernism. It is now a fashion symbol. In conclusion, I would like to say that if we are able to inculcate an umbrella`s qualities into our nature, our life would be easy and lot better. Just yesterday I saw a girl hitting a guy with an umbrella who was trying to molest her. So you see, umbrella can also be used as a dangerous weapon. The same way, I can turn dangerous when my bitchy side is provoked. But the need of an umbrella can never be replaced with any virtual thing. Times may come when human stops the usage of vehicles to travel. Technology in those times will provide him technology to transport wherever he wants. But an umbrella can never be replaced. Humans will always need them no matter what. ‘I am invincible and my existence will never be replaced.’- the autobiography of an umbrella.